Earth science is always making progress, and so is Earth Science Week. We are continually experimenting, expanding, and improving to serve our audience effectively. Each year, we add components and resources, often making use of the latest technology. Following are some of the most significant innovations of recent years. At the main celebration of the ninth annual National Fossil Day in Washington, D.C., AGI educated and entertained visitors with a green screen-equipped “Paleontology Play Space” photo booth, funded by the Paleontological Society. AGI staff exhibited at Energy Day festival in Houston as part of a collaboration with Consumer Energy Alliance. AGI staged its photo exhibit from the Earth Science Week 2017 Photo Contest. The exhibit took place at Washington, D.C. Mazza Gallerie as well as Terminal B of the George Bush Intercontinental Airport in Houston. Kenneth L. Huff received the 2018 Edward C. Roy, Jr. Award for Excellence in K-8 Earth Science Teaching at the National Earth Science Teachers Association (NESTA) Friends of Earth Science Reception during the National Science Teachers Association (NSTA) National Conference in Atlanta. An updated Earth Science Week Event Registry enabled participants to promote their events more effectively than ever. All registered events were listed on Earth Science Week’s Events In Your Area site. AGI released three chapters of its original film series, "Earth as Inspiration." The series - narrated by AGI Earth Science Education Ambassador and former U.S. Secretary of the Interior Sally Jewell - underscores the importance of Earth science learning and understanding for young and old audiences alike. An updated No Child Left Inside (NCLI) Day Guide was made available in PDF format for easy printing and outdoor use. This free guide provides everything you need to start planning your own NCLI Day event, including any of 17 outdoor learning activities recommended for elementary, middle, and high school students. Unveiled just in time to help teachers prepare for Earth Science Week 2018 (October 14-20), Education GeoSource provides Earth science educational activities, curricula, teacher professional development, education standards, virtual field trips, videos and animations, assessment materials, funding opportunities, award information, organization contacts, and additional resources. For the first time this year, AGI offered the Earth Science Week Online Toolkit, just in time to celebrate Earth Science Week 2018. As a digital complement to our popular Earth Science Week Toolkit, which annually ships to 14,000 teachers and geoscientists, the Online Toolkit provides a curated selection of materials from Earth Science Week Toolkits past and present. Earth Science Week, the worldwide celebration organized annually by the American Geosciences Institute (AGI), was formally recognized in a resolution introduced in the U.S. House of Representatives. Earth Science Week finished 2018 by announcing the theme for Earth Science Week 2019 (October 13-19, 2019): Geoscience Is for Everyone. This theme emphasizes both the inclusive potential of the geosciences and the importance of the geosciences in the lives of all people. Earth Science Week made a big noise about geoscience with the help of National Public Radio’s popular call-in talk show, Science Friday. Host Ira Flatow kicked off a Science Friday Science Club, which connected participants with informative articles, scientific expertise, and an AGI webinar on rocks. Science Friday’s Earth Science Week effort reached an estimated 4.5 million people by radio, website, and social media. AGI staff exhibited at Energy Day festivals in Houston and Denver as part of a new collaboration with Consumer Energy Alliance. In Denver, AGI staff also exhibited at Educator Night at the Denver Museum of Nature and Science. AGI produced a brief video honoring M.J. Tykoski, winner of the Edward C. Roy, Jr. Award for Excellence in K-8 Earth Science Teaching. and promoting the importance of high-quality education in the geosciences. At the main celebration of the eighth annual National Fossil Day in Washington, D.C., AGI educated and entertained visitors with a green screen-equipped “Paleontology Play Space” photo booth, funded by the Paleontological Society. To celebrate the sixth annual Geologic Map Day, the U.S. Geological Survey and AGI held a “Geologic Open House” at Great Falls Park in Virginia. For the first time, the popular Earth Science Week Calendar classroom investigations featured notations explaining how each activity aligns with the Next Generation Science Standards. New to the Earth Science Week 2017 Photo Contest, AGI debuted an online resource, the “Earth and Human Activity Here” Photo Map. Select photo entries are featured on the map, linked to the location of origin. This innovation serves as a powerful educational resource, fueling classroom discussions with eye-catching examples. AGI staged its first-ever exhibit of photos from the Earth Science Week 2017 Photo Contest. The exhibit took place at Washington, D.C.’s Union Station, one of the country’s busiest train stations, with some 100,000 passengers visiting daily. The Earth Science Week Event Registry enabled participants to promote their events more effectively than ever. All registered events were listed on Earth Science Week’s Events In Your Area site. Earth Science Week finished 2017 with a major event to kick off the next year’s program theme, “Earth as Inspiration.” AGI welcomed hundreds of educators, students, and others to explore connections between the geosciences and the arts during “The Late Shift: STEAM-Powered December” at the Torpedo Factory Art Center in AGI’s headquarters city of Alexandria, Virginia. A highlight of the evening was an address on the importance of geoscience by AGI Earth Science Education Ambassador and former U.S. Secretary of the Interior Sally Jewell. The Our Shared Geoheritage website provided educators, students, and others with information, state-by-state examples, and classroom activities dealing with geoheritage. The One Shared Place video contest, new in 2016, offered teams of educators and students an opportunity to learn and share about local geoheritage while creating a brief video documentary. Earth Science Week Citywide Celebrations took place nationwide, with AGI providing kits of learning materials to more educators than ever in cities including Denver, Houston, Richmond, and Washington, DC. Earth Science Week added a new Focus Day in 2016 with the debut of Earth Observation Day, a STEM educational outreach event of AmericaView and its partners, during the weeklong celebration of the geosciences. Expanding its presence at major science events, Earth Science Week exhibited activities and resources at the USA Science & Engineering Festival in Washington, DC, and at the AAPG/SEG International Conference & Exhibition in Mexico, as well as the traditional National Science Teachers Association Annual Conference. Earth Science Week promoted participation in the Webinar on the Earth and Space Science Portion of the NGSS as part of AGI’s collaboration with the National Association of Geoscience Teachers to strengthen implementation of the Next Generation Science Standards at the state level. The Visualizing Earth Systems page was created to provide educators and students with powerful examples of geoscience visualizations, graphic representations that help build understanding of important concepts and phenomena. As part of its Citywide Celebrations program, Earth Science Week pioneered Stakeholder Receptions in Denver and Houston to gather local partners, strengthen connections, and promote increasing activity. A new Earth Science Week promotional video was created to showcase the program, generate excitement, and build support for expanding activities (view online October 2015). Earth Science Week staff played a major role in crafting a landmark report in partnership with the National Park Service, entitled America’s Geologic Heritage: An Invitation to Leadership (view online October 2015). In addition to the long-running poster series produced by Earth Science Week with the National Park Service’s Geologic Resources Division, the program also initiated a new poster series with the National Park Service’s Air Resources Division, promoting clean air nationwide (view online October 2015). Google and Student Energy became key new partners, contributing materials on mapping, energy, and other geoscience topics to the Earth Science Week Toolkit. The program’s new Be a Citizen Scientist page linked teachers and students to information on many “citizen science” initiatives operated by USGS and other leading geoscience organizations. The Howard Hughes Medical Institute became a major partner, contributing materials that deal with Earth and environment to the Earth Science Week Toolkit. Earth Science Week introduced Geoscience for Everyone Day to encourage underrepresented populations including women, minorities, and people with a range of abilities to explore careers in the geosciences. International Archaeology Day also became part of Earth Science Week, courtesy of a new partner, the Archaeological Institute of America. The program kicked off its Citywide Celebrations initiative with Earth Science Week Houston, a hugely successful effort engaging partners in schools, universities, museums, and other groups. Earth Science Week promoted the launch of the Center for Geoscience & Society with announcements and information linking educators to this valuable new resource. The award-winning Switch Energy Project was a major focus of Earth Science Week, distributing a DVD and associated education activities and resources through the program. AGI International Affiliates and international members of all AGI Member Societies were formally invited to enter the Earth Science Week Photography Contest for the first time, expanding this outreach initiative to a global scale. The program kicked off its ongoing tradition of Earth Science Week Webcasts, now delivered quarterly, providing brief visual presentations and narration on topics including contests, awards, special events, and teaching resources. Earth Science Week offered a new Career Resources page to provide young people with information on geoscience careers, scholarships, and internships. Through an ongoing partnership with Esri, Earth Science Week promoted GIS Day with its electronic newsletter and activity calendar, spreading the word about GIS technology. Earth Science Week’s new Classroom Activities online resource allowed teachers to search this database of over 100 free activities by grade level, science standard, geoscience topic, or keyword. Earth Science Literacy Day, celebrated for the first time on the Monday of Earth Science Week, promoted study of the “big ideas” of Earth science codified by the NSF-supported Earth Science Literacy Initiative. 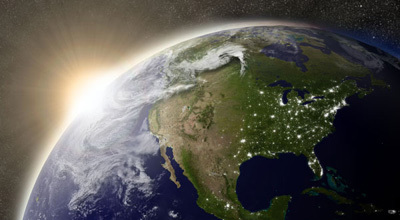 Big Ideas of Earth Science videos and activities brought the nine “big ideas” of Earth science to life, accompanied by classroom activities to help students understand them. Earth Science Week became a major player on Twitter, where thousands now follow the program’s news and updates. Earth Science Week launched National Fossil Day in partnership with the National Park Service, promoting paleontology and the nation’s fossil resources during the weeklong celebration. Created in collaboration with Schlumberger Excellence in Educational Development, the SEED Earth Science Week Online Toolkit provided geoscience education resources in both Spanish and English. Earth Science Week presented activities and resources at the first-ever USA Science & Engineering Festival, the country’s largest and only national science festival. Earth Science Week promoted the National Groundwater Association’s kickoff of the first annual Protect Your Groundwater Day. AGI’s new Why Earth Science video provided a brief, exciting overview of this vital subject, using eye-popping footage from the “Faces of Earth” television miniseries. Visiting Geoscientists: An Outreach Guide for Geoscience Professionals, a handbook produced by AGI and AAPG, offered detailed guidance for professional geoscientists venturing into classrooms to share their expertise. The Earth Science Organizations online resource was created to facilitate networking at the local and regional level by providing a clickable map of public, private, and nonprofit organizations across the geosciences. The Events Near You page was introduced to enable participants to find Earth Science Week events taking place, state by state, near where they live. The program began promoting National Wildlife Refuge Week, which routinely overlaps with Earth Science Week, and including U.S. Fish & Wildlife Service materials in Earth Science Week Toolkits. In cooperation with USGS, AGI launched No Child Left Inside Day to promote geoscience learning activities outdoors, complete with a guide for organizing events. Distributed through Earth Science Week in conjunction with the release of the major motion picture of the same name, the Journey to the Center of the Earth 3D Educator Guide featured puzzles, games, and learning activities focusing on Earth science. The Earth Science Week Photo Gallery invited participants to share photos online and spread the excitement of the event. Earth Science Week’s Facebook presence became a major vehicle for promoting resources and participation. The Edward C. Roy Jr. Award for Excellence in K-8 Earth Science Teaching, given annually since 2008, continues to promote the highest standards in the teaching of geoscience. The Pulse of Earth Science website, created at the request of USGS, provided the latest data on the status of Earth science education in U.S. schools, as well as an Advocacy Guide designed to help concerned parents and others influence policy to improve Earth science education in their local systems. AGI’s Earth Science Week Update electronic newsletter began its current monthly distribution cycle, ensuring that teachers, students, and others are prompted to think of Earth science not only once a year but all year long. Earth Science Week’s long-running National Park Service poster series kicked off with “Caves of the National Parks,” which soon would be followed by posters focusing on topics such as volcanoes, glaciers, and geologic heritage in the national parks. Launched in cooperation with the Geological Society of America, the first International EarthCache Day inaugurated an Earth Science Week tradition of geocaching activities that incorporate a geoscience education element. AGI’s new K-5 GeoSource, a professional development website for elementary-level geoscience education, was promoted in the Earth Science Week Toolkit through an elementary activity poster developed in partnership with Scholastic Inc. The Earth Science Activity Calendar debuted, providing a school-year wall calendar featuring classroom activities, historic dates, fun facts, major conferences, and promotions for program partners. USA Today’s K-12 Education Online featured a high-profile link for Earth Science Week during the celebration. announced the theme for Earth Science Week 2019 (October 13-19, 2019): Geoscience Is For Everyone. This theme emphasizes both the inclusive potential of the geosciences and the importance of the geosciences in the lives of all people.